* Chrome Finish ALL BBK Shorty Tuned Length Mustang 1996-2004 4.6 GT 2V Exhaust headers are manufactured with 1 5/8" CNC mandrel bent tubing for unrestrictive airflow and one piece laser cut 3/8" flange for added strength and durability. ALL BBK Headers are Pressure tested to ensure leak free performance. Each BBK Mustang shorty Tuned length exhaust header for the 1996-2004 4.6L GT V8 Ford Mustang has been designed and dyno tested at the BBK headquarters in Southern California to Maximize performance. BBKs Mustang headers offer distinctive quality that guarantees many years of top performance. 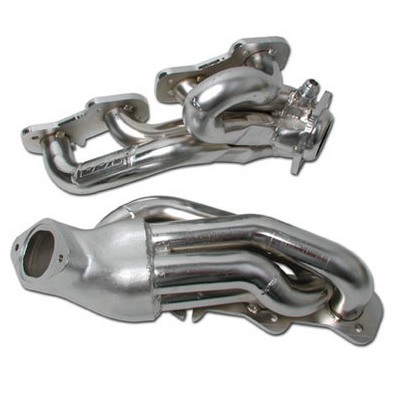 These BBK CNC Series headers for the Ford Mustang 4.6 liter GT come with our Chrome finish. Direct bolt on  all gaskets and hardware included. Click Here for Instructions No one else can Stack up to the bold clean styling of our aftermarket Billet / Stainless Steel Dress Ups, Street / Strip / Racing Suspension and Performance Parts for your American Muscle Car! Fits these Vehicles: 1996 1997 1998 1999 2000 2001 2002 2003 2004 V8 GT 4.6L 2V Mustang Steeda Roush & Saleen Vehicles.